Sculptor Christopher Fennell’s sculpture “Light Tree” has made an appearance on the sidewalk in front of a downtown Huntsville development and, even though it isn’t lit up yet, it is already a lively and striking addition to the Huntsville townscape. Outdoor installations made from recycled materials are Fennell’s specialty. When I became aware of the artist and his work, I began to run across his pieces as I travelled. 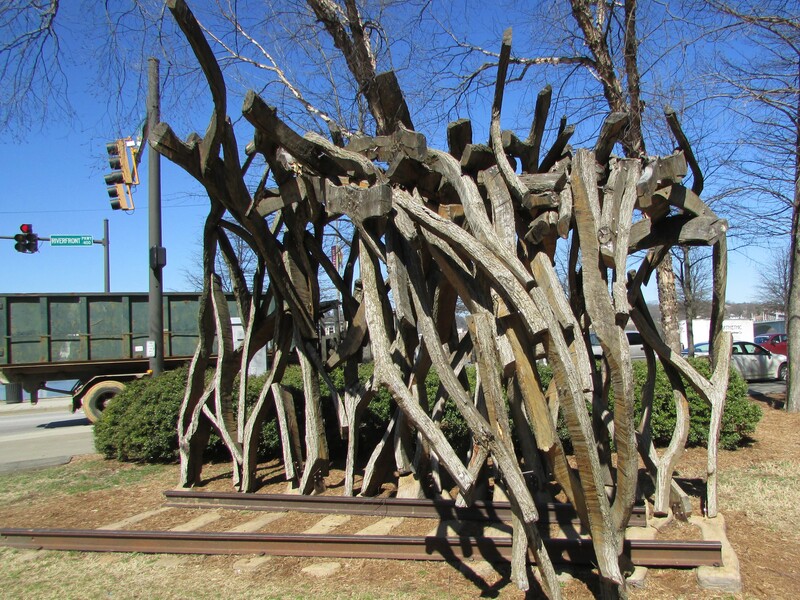 “Rail Wave,” beside the river in Chattanooga, features railroad tracks across wooden ties that rise up into a cascading wave tunnel – one of Fennell’s recurring motifs. “Magic City,” Fennell’s temporary installation at an annual Birmingham art fair, featured boards covered with imaginative self-portraits made by Birmingham school-age artists. Fennell shaped the boards into a massive wooden flame that the viewer could walk inside, around, and through. Browsing through Fennell’s website (www.cfennell.org), one sees recycled wood, boats, windshields, rods, baseball bats, ladders, garden tools, car parts, etc. transformed into installations – both permanent and temporary – and located throughout the country. The beautiful sculptures are often rooted in the shapes of nature and often tempered with a charming whimsy. Fire, water, wind, fish, and fowl are among frequent natural motifs. Also recurring are industrial relics redefined; one of my favorite Fennell incarnations is an old school bus transformed into a bus stop in Athens, Georgia. I met Chris Fennell and began to grasp the method behind his art when I tagged along with Scott Smith – another artist who makes frequent use of cast-off and recycled objects – and Chris to scope out a barn near Tullahoma, Tennessee. The barn was on a family farm that spanned generations and its razing was imminent. Scott was contacted about the possible availability of tin and wood from the structure and contacted Chris to plan a trip. Chris and Scott examined and photographed the barn. Chris later went back and spent a couple of weeks taking the barn down and used the wood for future projects. After earning degrees in mechanical engineering and sculpture at South Florida, Christopher Fennell got his M.F.A. in sculpture from Georgia. He uses his engineering background to assemble complex sculptures, often from hundreds of assorted pieces meticulously melded together for an effect that seems airy and effortless. Fennell is now based in Birmingham. The new Huntsville sculpture is something of a departure from the typical Fennell piece. 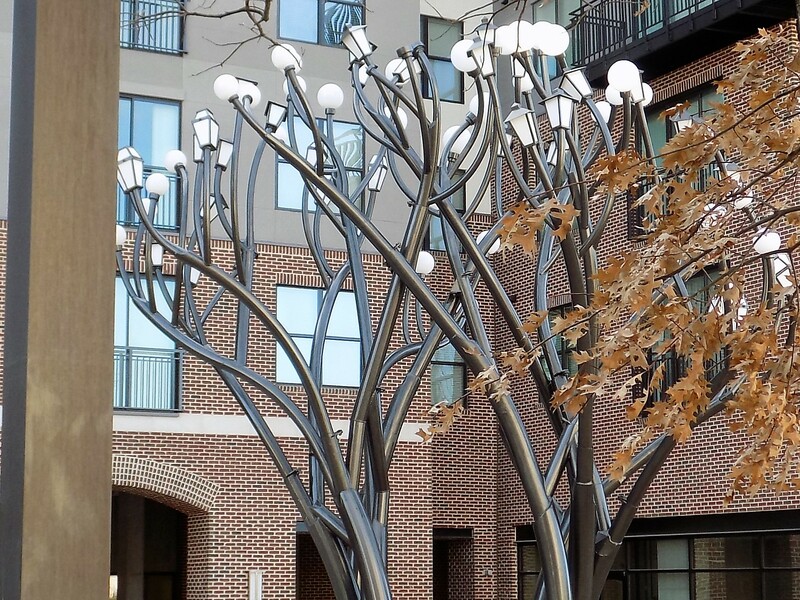 It is composed of sleek slate grey tree-like structures with “branches” topped by sixty lamps of different shapes. 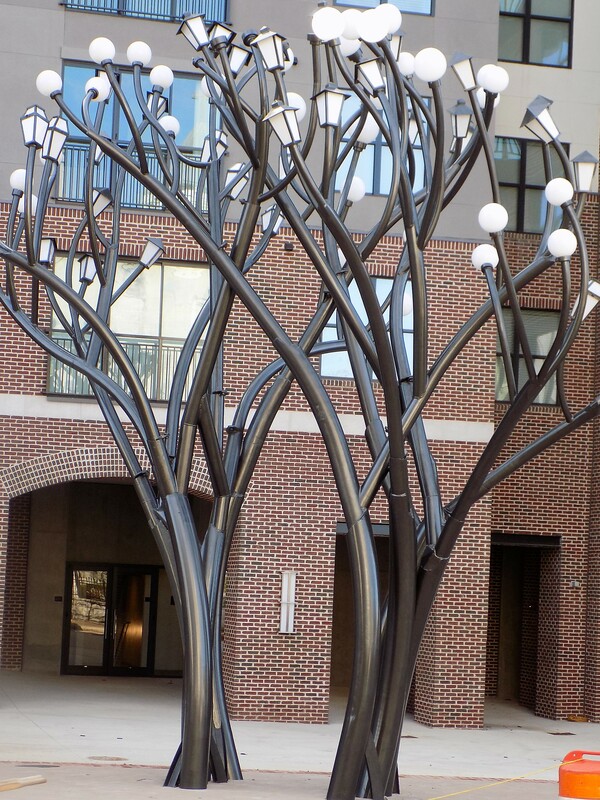 The graceful structures bend together forming a passage through the “Light Tree.” As one enters the downtown on Jefferson Street, the sculpture appears as a beacon to the area, even on a bright sunny day before its lights are shining. My favorite view of “Light Tree” is in my rearview mirror as I drive past it. After passing the vibrant energy of the soaring sculpture, it becomes a calm and tranquil afterimage for the traveler moving on down the road. “Light Tree” currently stands in the middle of a streetscape construction zone so it is hard to get up close right now. It will be lit nightly when the street project is done. I find myself taking detours through town on the way home these days just to check on the progress and anticipate the time when it will shine brightly and complete. This entry was posted in Christopher Fennell sculpture and tagged Christopher Fennell, Huntsville Alabama, Light Tree by Christopher Fennell, Magic City by Christopher Fennell, public art in Huntsville, Rail Wave by Christopher Fennell, recycled art, Scott Smith art on February 12, 2017 by gedwardjourney.